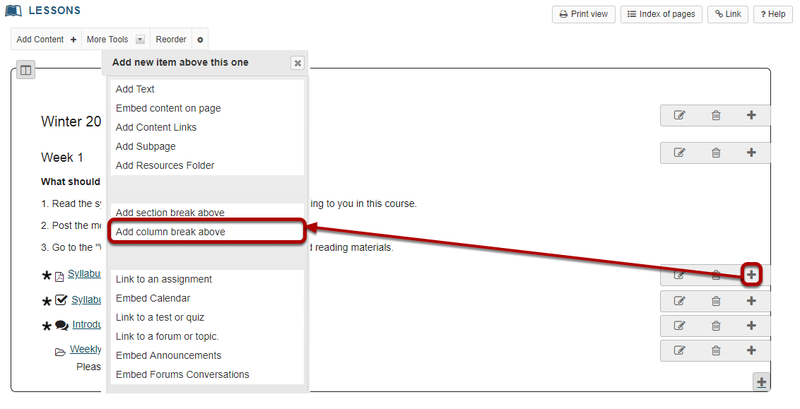 Sakai Community DocumentationSakai 19 User Guide (English) LessonsHow do I create two columns on a Lessons page? Adding two columns on a Lessons page breaks up one big block or one section into smaller pieces so that the page is more readable and flows better. It also makes better use of the white space on the page. Adding two columns on a Lessons page involves two steps. Decide how to group items. Zoom: Decide how to group items. Identify how you want to group the items in a section into two columns. Click the + button and Add Column Break Above. Zoom: Click the + button and Add Column Break Above. Click the + button to the right of the item where you want to add a column break. You will see the Add menu window pop up. Click Add column break above. You will see the items are now grouped into two columns on the page. Each is displayed as a block with rounded-corner borders. Prev: How do I create multiple sections on a Lessons page? Next: How do I create two columns inside a block on a Lessons page?